Thoroughly enjoyable reading experience. Some real moments of beauty and suspense. I've read better word crafters, but Guterson creates an incredibly compelling ambiance, into which the characters and situations are woven to produce an organic, seamless whole. wahhh chick-lit. 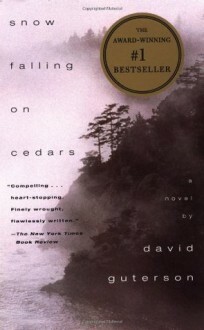 if you want extremely sentimental descriptions of wind-blown puget sound pacific north west forests with fuzzy-focus romanticism, then this is the book for you.writing is skillful, not a two-star, but probalby perfectly located at 3/5.